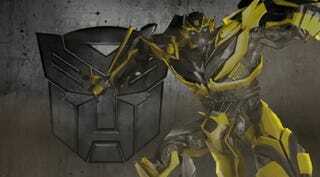 I don't care which universe he's in, plucky yellow Autobot Bumblebee always rocks. And hey, that's two voice actors Activision doesn't have to hire! If you don't love Bumblebee for some reason — maybe you are a communist, which is okay — once you watch the final scene from the Transformers Prime Beast Hunters series, where the Autobot scout takes out the leader of the Decepticons and gets his voice back, you will want him to have your babies. So yeah, great kid. No wonder he's heading up next year's new Transformers animated series.